Rose Orelup collected 1,000 white plastic grocery bags and sewed them together to produce a winter dress. 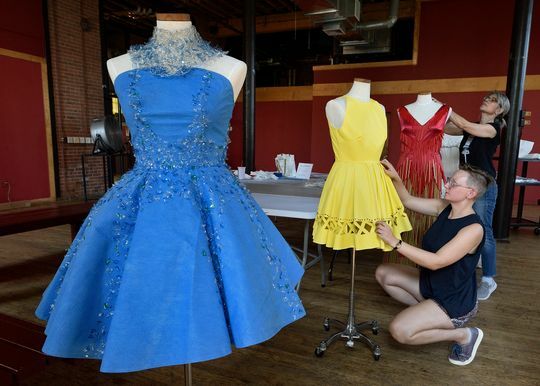 Her other recycling-based fashion creations included garments made from drinking straws, window blinds, surgical floor mats, plastic bottles and used coffee filters. Haute Trash is a social commentary satire, as it examines the wastefulness of the American culture and stresses the potential for recycling every day throw away items into one-of-a-kind fashions. The designers of Haute Trash are ecologically-minded artists who have chose to use fashion as a statement to encourage people to think twice about their trash. NowThis News is an American liberal website and media company, which primarily distributes video news content to mobile devices and social platforms. “We believe in using creativity to spread awareness of global issues that are challenging our planet,” Merli said in her email. “There are many unethical practices within the fashion industry worldwide that have harmful effects on the environment. Trashion Fashion offers a way to reimagine items that end up in the waste stream as materials for creation. We empower our audience, designers and students to rethink what is possible. We know there are solutions that can reduce waste and have gentler effects on the planet, it’s our goal to find them.